^ 1.0 1.1 Fine, Larry. Acoustic & Digital Piano Buyer – Spring 2011. Brookside Press LLC. 2011: 191. ISBN 978-192914531-7. ^ Steinway Musical Instruments 2011 Annual Report on Form 10-K (PDF). Steinway Musical Instruments, Inc.: 7. March 15, 2012 [March 15, 2012]. ^ Steinway Grand Pianos. Steinway & Sons – American headquarters. [July 27, 2011]. ^ Steinway Flügel [Steinway Grand Pianos]. Steinway & Sons – German headquarters. [July 27, 2011] （德语）. ^ Steinway Upright Pianos. Steinway & Sons – American headquarters. [July 27, 2011]. ^ Steinway Klaviere [Steinway Upright Pianos]. Steinway & Sons – German headquarters. [July 27, 2011] （德语）. 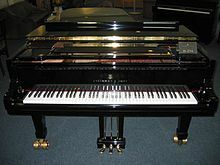 ^ Good, Edwin M. Giraffes, black dragons, and other pianos: a technological history from Cristofori to the modern concert grand. Stanford University Press. 2002: 303. ISBN 978-0-8047-4549-9. ^ Steinway & Sons - Steinway Pianos 互联网档案馆的存檔，存档日期2010-01-03. ^ 9.0 9.1 Mohit Joshi. 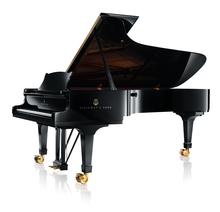 Steinway & Sons unveils most expensive piano. Topnews. Manas Informatics Pvt. Ltd. May 11, 2008 [August 29, 2011]. ^ 10.0 10.1 November: 'Art' piano is Expo musical key. Shme – Today's Shanghai. [August 29, 2011]. ^ Alma-Tadema. Steinway & Sons. [January 13, 2009]. （原始内容存档于2009年1月25日）. ^ Ratcliffe, Ronald V. Steinway. San Francisco: Chronicle Books. 2002: 158. ISBN 978-0-8118-3389-9. ^ Designed by Sir Lawrence Alma-Tadema – Model D Pianoforte and Stools. Clark Art Institute. [February 6, 2015]. ^ Two Million Dollars For A Piano...Imagine That. Forbes. [May 26, 2009]. ^ George Michael buys Lennon's piano. BBC News. [January 13, 2009]. Barron, James. Piano: The Making of a Steinway Concert Grand. New York: Holt. 2006. ISBN 978-0-8050-7878-7. Chapin, Miles. 88 keys: The making of a Steinway piano. New York: Potter. 1997. ISBN 978-0-517-70356-4. Ehrlich, Cyril. The Piano: A History. Oxford, United Kingdom: Oxford University Press. 1990. ISBN 978-0-19-816171-4. Fine, Larry. 2007–2008 Annual Supplement to The Piano Book. Jamaica Plain, Massachusetts: Brookside Press. 2007: 13–14, 96–100, 184–187. ISBN 978-1-929145-21-8. Fine, Larry. The Piano Book: Buying & Owning a New or Used Piano 4th revised. Jamaica Plain, Massachusetts: Brookside Press. 2001. ISBN 978-1-929145-01-0. Fostle, Donald W. The Steinway Saga: An American Dynasty. New York: Scribner. 1995. ISBN 978-0-684-19318-2. Giordano, Sr., Nicholas J. Physics of the Piano. Oxford, United Kingdom: Oxford University Press. 2010. ISBN 978-0-19-954602-2. Goldenberg, Susan. Steinway: From glory to controversy; the family, the business, the piano. Oakville, Ontario: Mosaic Press. 1996. ISBN 978-0-88962-607-2. Kehl, Roy F.; Kirkland, David R. The Official Guide to Steinway Pianos. Montclair, New Jersey: Amadeus Press. 2011. ISBN 978-1-57467-198-8. Lieberman, Richard K. Steinway & Sons. New Haven, Connecticut: Yale University Press. 1995. ISBN 978-0-300-06364-6. Matthias, Max. Steinway Service Manual: Guide to the care and maintenance of a Steinway 3rd. Bergkirchen, Germany: PPV-Medien/Bochinsky. 2006. ISBN 978-3-923639-15-1. Ratcliffe, Ronald V. Steinway. San Francisco: Chronicle Books. 2002. ISBN 978-0-8118-3389-9. Steinway, Theodore E. People and Pianos: A Pictorial History of Steinway & Sons 3rd. Pompton Plains, New Jersey: Amadeus Press. 2005. ISBN 978-1-57467-112-4.